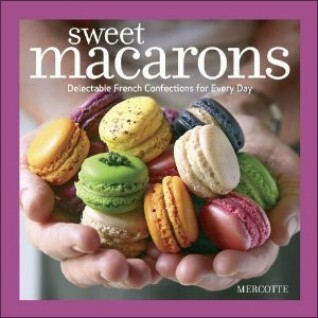 Sweet Macarons- Delectable French Confections for Every Day by Mercotte starts with the author explaining her goal in the book, which is to demystify the making of these wonderful treats. The author does a wonderful job. If you've never made macarons before, or have no experience with piping, meringues or the basic fillings, she walks you through the steps in a conversational and reassuring way. Starting by explaining the ingredients and giving you tips and tricks for making the cookies including handy things like the best way to fill the pastry bag and how to space them on a cookie sheet. Then she gets into more detail. Rather than having you go straight into working with meringue whipped egg whites and almond meal, she walks you through 3 cookies that help you learn how to pipe correctly, how to bake meringues and then finally, working with almond meal. After that, she explains how to make the batter for macarons. She gives 2 methods, the more involved Italian meringue recipe, or the simpler, easier French recipe for meringues, and how to turn that into macaron batter. The next part focus on fillings, and the basic filling recipes given can be flavored many ways. Her basic filling recipes include buttercream, a couple thick creamy fillings, some ganache fillings, jam and praline filling. Using just this section of the cookbook, and varying flavors and colors on the fillings, you could make a lot of types of macarons. Then the recipes, which are fancy enough to impress anyone. Starting with salted butter caramel, then getting into lots of other flavors. I'm not a fan of licorice flavor, but even skipping the anise/fennel and the licorice flavored cookies, there are still a lot of great options. Some are fruity, some are spicy, some have tea or floral flavors. These are recipes that can be paired easily to echo the flavors of tea, coffee or wine for entertaining. The creme brulee ones are amazing. If you like traditional cookbook formats, this one may not be your cup of tea. The tone is conversational, and the recipes aren't laid out traditionally. Instead of line by line ingredient lists, the ingredients are listed in a single paragraph separated by commas. The instructions are very well written with good detail. The recipes are also followed with tips for modifying that recipe to suit your own tastes. There are also ideas for things to do with failed macarons and tips on fillings for really quick macarons for when you have cookies in the freezer and just want a fast fix. My 17 year old daughter is very excited by macarons, and the instructions are perfect for the way she learns. So I'm just thrilled with the layout and the detail. The only thing that would make this book better for my daughter's and my macaron adventures is a spiral binding so it would lay flat. The photographs are gorgeous, the recipes are good, and the step by step breakdown of the process of making macarons is well written. Published by The Taunton Press.